This year, I am all about keepin’ it simple. I started my Christmas decorating in my breakfast nook this year. I spend a ton of time here, so I want it to really reflect my personality. I love all things aqua and white, fabric, glitter, and chippy paint. So, when decorating my nook, I started with my glitter in glass ornaments, added a sweet little countdown to Christmas, then hung JOY chargers with ribbon. The only thing missing was a centerpiece…something simple, made with some scrap pieces of fabric. I found these heavy cardboard cones at Michael’s and just knew I could use them somewhere. I had no idea what I was going to do with them, then it hit me…cover them with fabric, and group them together…won’t that be pretty! I wanted each tree to be a little different, so I gathered three different fabrics. 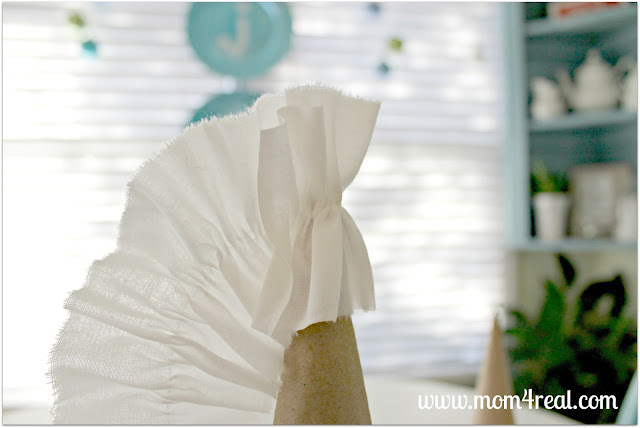 I cut long strips of white fabric and sewed a simple ruffle to wrap around the large cone. I ripped strips of aqua to wrap diagonally around the middle cone, and I ripped thin strips of dropcloth fabric to wrap from top to bottom on the smallest cone. 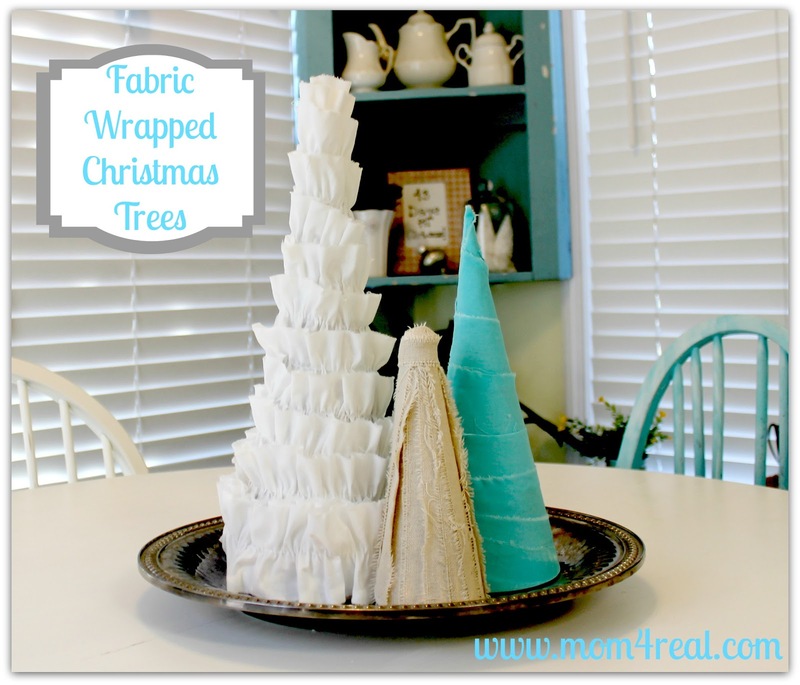 For each tree, I started by hot glueing fabric at the top and working my way down. « The Coolest Gift For The Sports Freak In Your Life! Jess these tress are simply too cute for words! How simple..but so stinkin’ cute! Thanks for sharing!! These are adorable! Thank you so much for sharing with us! Have a Happy Thanksgiving! Jessica…simply adorable!! 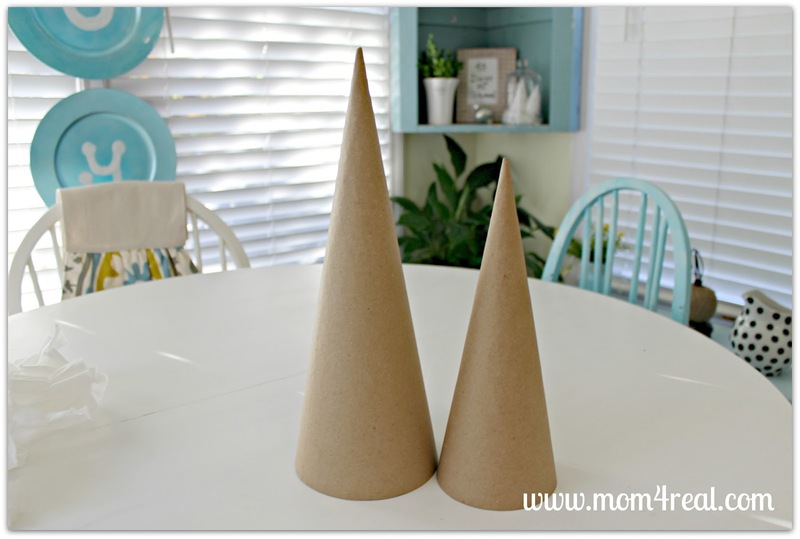 !…Just the perfect decorations for your breakfast room…love that you chose to stay with the color scheme of the room..what could be better than burlap and ruffles!!! What a simple and cute Christmas tree you have here Jessica, I will have a try of this one. Love the trees! The nook looks like a fun place to spend the holidays. Your breakfast nook is such a happy place! 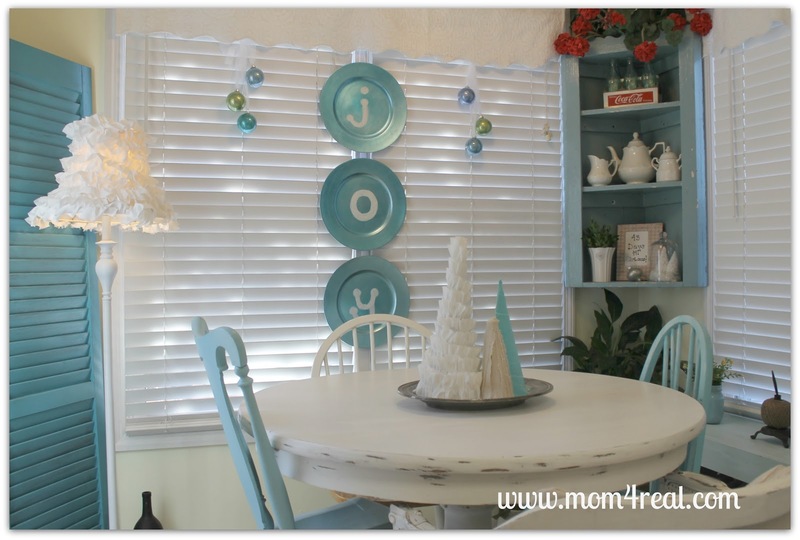 The aqua and white combination is so pretty along with your cute decorations. Thanks for linking up to our party! I made some similar trees using scraps from my grain sacks. I was actually shocked at how well they turned out. :o) Happy Sunday Jessica! Really, really cute. I love how this looks so festive while using non traditional Christmas colors. Love the trees!